In the same way that some pets become agitated when they are not walked or given attention, there are also some pets that behave the same way when left alone overnight. If your pet is used to sleeping in your room or feeling your presence during the night, they can become destructive and agitated if the presence is absent. Young pets such as puppies also need extra attention throughout the night, especially when it comes to potty training and their safety. At Pets R Family Too, we understand exactly what it takes to ensure your pet’s happiness overnight. An overnight pet sitting service is great for pet owners that want to make certain that their pets are taken care of while they are away from home, and also serves as extra security. Although we can rotate lights around with regular pet sitting visits, nothing will secure your house more than having one of our pet sitters inside. Furthermore, our overnight pet sitters will make sure that your pet gets the evening attention that they need: whether it be a walk or playing with them. Along with evening activities, our pet sitters will also take care of feeding, cleaning, and administering medication as needed. A morning walk is always included as well. To ensure that we have all of the details down to the dot, we always meet with pet owners before their travels to take notes and get acquainted with the family pets. During this time we learn everything needed, even small rules for pets such as the rooms or sofas pets cannot enter or jump on. If a pipe bursts in your home or a weather emergency occurs, our pet sitters will also be ready to react accordingly. We have been known to save pet owners thousands of dollars by merely being in their home during an emergency and notifying the proper people. At Pets R Family Too, our overnight pet sitting sessions are usually 9 hours (9pm - 6am) and we take care of everything. Pet sitters arrive with their food, drinks, bed sheets, and laptop, so there’s nothing you have to worry about. Traveling can be quite hectic as it is. We aim to make the process of having your pet and home left in good hands as easy as can be. When it comes to sleeping arrangements for your sitter, they will take care of putting their linens on the bed assigned to them. They will bring their food and use a stove or microwave if necessary, as well as have a list of any special instructions or restrictions you leave behind on-hand. Overnight petting sitting is also a really good choice for pet parents that have multiple pets, because other pet needs and walks are included at no extra charge. None of your pets’ routines will change, and they will continue being happy and taken care of throughout your travels. Whereas pet daycares and kennels can leave dogs stressed out, or even spreading illnesses, an in-house pet sitter eliminates all of these worries. 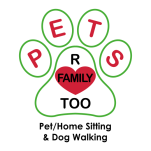 At Pets R Family Too we are also bonded, licensed, and insured. You can rest assured that we will provide a professional service time after time again. If you have questions or want to get a free quote for overnight pet sitting, give us a call today at 702-614-7663.